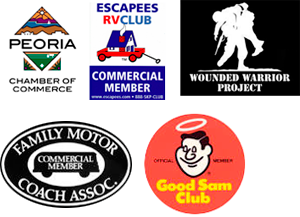 Fix My RV AZ: We Bring the Repairs to You! When you first start packing your bags for the annual family vacation in the RV, you are not planning to have to stop for repairs. Having to take that precious time away from sightseeing, shopping, and relaxation can ruin your carefully planned vacation. However, if you happen to traveling through Arizona and find yourself in need of Goodyear RV repair, the experts at FixMyRVAZ will come to you! With minimal disruption of your family’s vacation time, our certified professionals will drive out to your RV’s location, troubleshoot your problem carefully, and take our time to ensure that every aspect of your Goodyear RV repair is completed thoroughly and accurately. We are also always happy to provide assistance for any Goodyear RV repair do-it-yourself-ers out there, either by phone or in person. For more information on the services we can provide, or to schedule an appointment for Goodyear RV repair, contact the certified RV repair technicians at FixMyRVAZ today!